So to preserve this excellent article I am re-publishing it here so that it won't be lost forever, and so fellow typophiles don't have to wait for the Wayback Machine to try and load it. I've also done my best to update all the links so that they point to updated pages, and in some cases have had to replace/remove links that have died. A little over a month ago I received an e-mail from fellow Typophile Robert Farrelly. He alerted me to the fact that the new James Bond movie Quantum of Solace had some interesting typography – specifically the location cards that designated where the action was taking place. The choice of typography was adapted to the geographical location. When asking MK12 about those pieces, they told me they had been created by the British art collective Tomato. I had already noticed the movie logo uses Neutraface with a customised Q. Christian Schwartz’s geometric sans is an interpretation and extrapolation of the signage found on architect Richard Neutra’s buildings. It comes in two versions: the original with the Art Deco inspired low crossbar and the more conventional Neutraface No. 2. Now the problem with discussing movies while they are still playing in theatres is that usually there is not much quality imagery to be found online, mostly due to copyright issues and so on. Finally the location cards surfaced on Flickr and on the Tomato website. Tomato is a collective of artists, designers, musicians and writers which was founded in 1991. I first became aware of them through their breathtaking visuals for one of their most visible projects: Underworld, the successful musical collaboration of Rick Smith and Karl Hyde. Each one of the creatives involved in Tomato is essentially independent, choosing to work and collaborate with the wider group whenever appropriate. Currently there are eight active members in the collective but many others have played important roles during the ongoing development of Tomato. For the past seventeen years Tomato has recorded successes with hosting workshops, publishing, exhibiting, live performances and public speaking as well as working with clients in the areas of advertising, architecture, fashion, public installations, music, tv & film and graphic design. As I mentioned above one of their recent film projects were the location cards for Quantum of Solace. The location card for Bregenz, Austria features one of the original designs for Futura by Paul Renner. As you can see below the initial drawings for the Bauhaus typeface were far more experimental in their exploration of geometrical forms, and the Futura we all know is in fact “watered down” on a conceptual level. Paul Renner’s original drawings for Futura. One of the digitisations which follows the original concept quite faithfully is LTC Twentieth Century Medium Alt. Twentieth Century is based on Futura and was redrawn by Sol Hess for Lanston Monotype. The location card for La Paz, Bolivia looks like genuine commercial lettering found on walls and shop fronts in Latin America. The slightly irregular shapes lend the otherwise neutral grotesque a certain humanity and warmth. Enric Jardí’s Wilma with its myriads of variations includes some shaded styles which come really close. Vintage Gothic and P22 Bayer Shadow are similarly vintage looking; even more irregular are FF Bokka Shadow and Emigre’s Blockhead. The location card for Port Au Prince, Haiti – the only one not created by Tomato – is the work of MK12, who are responsible for the opening titles sequence ofQuantum of Solace. The rough painted letters immediately reminded me of Mogadishu, Cornel Windlin’s submission for FUSE 7. It isn’t available anymore, but Dirty Faces, FF Innercity share the same derelict, broken down atmosphere. N.B. : It would appear that the title design was changed for the home video release, or the article's author was provided with an alternate title card that wasn't actually used. As a result there is no identification provided, but it does appear to be a Western stylized font, and the rather un-creatively titled Western seems to be a pretty good match. - A.S. The location card for London (no need for mentioning the country) looks like it was carved into the asphalt (which is very odd). It is reminiscent of Classic Roman, one of a number of classy vintage caps available in digital format, like Aphasia, Beata, Carlton, ITC Luna, Felix Titling, Perpetua Titling, Serlio, and so on. Typophile pal Simon Robertson was able to correctly identify it as Albertus. The location card for Kazach, Russia uses a square constructivist stencil face. Constructivism is the preferred style most designers fall back on when they need to express Russian style. Not very original but it works. The location card for Siena, Italy features tasteful serif caps, specifically Caslon No. 540 Italic with an initial swash S. This choice is a bit bizarre as Caslon is a typically British face. Bodoni would have been more appropriate, and there are a number of digitisations that feature similar swash caps. Finally the location card for Talamone, Italy has a geometric sans which is not unlike Dino dos Santos’s wonderful Art Deco-ish Estilo, the main difference being the rounded stroke endings. All in all I quite like what Tomato did with the location cards. Instead or relying on one unified typographic style for the whole movie, they tried to match geographical location and mood. This adds some variation, and nicely enhances the cinematographic experience. 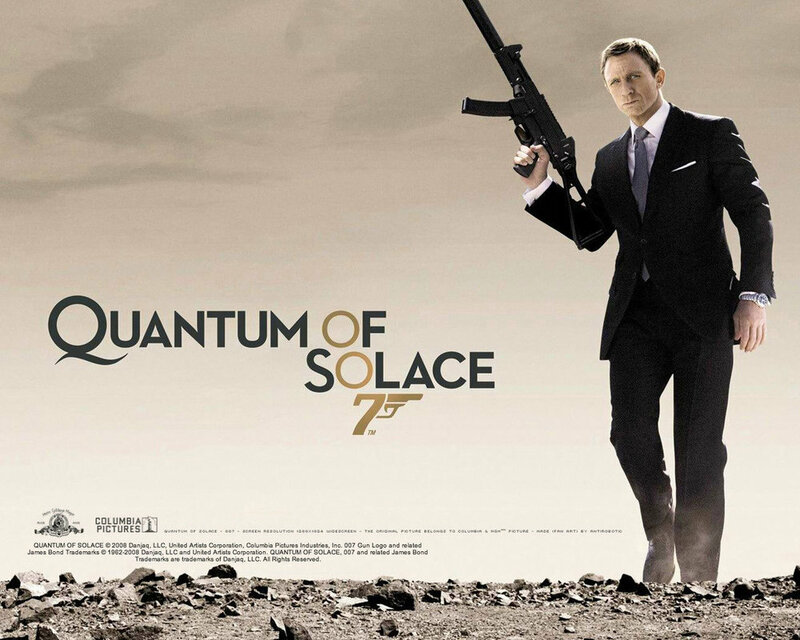 I'm really glad that in recent years people are coming back to Quantum of Solace and giving it its due. It's one of my favourite Bond films, and prior to Skyfall was easily the most beautifully shot of the series. I love the attention to details, such as these unique location cards, and the fact that it clocks in at around ninety minutes, leaving all the flab on the floor is admirable. If you want to learn more about the title sequence designed by MK12 be sure to check out the article from Art of the Title, which thankfully is still online.